WIDE COMPATIBILITY: This Bluetooth car kit is ideal for turning wired stereos and headphones into a Bluetooth-equipped system,Stream stereo music wirelessly through most home audio systems, car stereo system, smartphones, tablets, MP3 players, etc. ADVANCED CONFIGURATION: Support for TF card playback and card reader function. Equipped with the reliable Bluetooth 4.1 for faster and more stable connectivity, this Bluetooth car adapter supports A2DP,works up to 33 feet / 10 meters. EASY OPEARATION: Connect your non-Bluetooth speaker/car audio system with this device through 3.5mm male to male audio connector/cable, and pair your bluetooth phone/PC/Tablet with this device.if someone calls you simplest with One Button by pressing to answer and press again to hung up. BUILT-IN BATTERY:Powered by built-in rechargeable li-ion battery via mini USB port.Provides up to 8 HOURS playing and talking time. 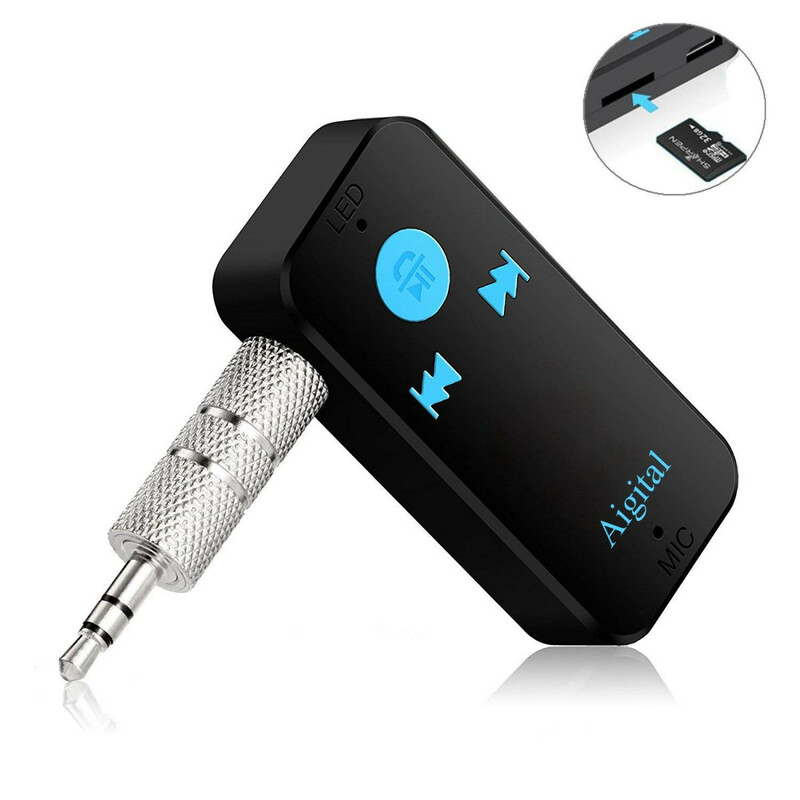 DOUBLE CONNECTIVITY: This bluetooth receiver can connect 2 Bluetooth kits at the same time for enjoying music and not miss any calls. Reliable Bluetooth 4.1 brings faster and more stable connectivity, available up to 33 feet Bluetooth signal. Enjoy hands-free calls and music anywhere ! 1. Bluetooth audio receiver: pair with your bluetooth devices via bluetooth, connect with your regular speakers/headphones via audio cable, achieve wireless playing. 2. TF Card: Insert your TF card into its card slot then this receiver will switch into local playback. You can switch mode between TF Card and Bluetooth by double click the volume key. 3. Card Reader: Use USB cable to connect this receiver (TF card inserted) with computer, then you can see it as a card reader to download and transmit music. 5. Whether you want Bluetooth convenience in your car, through your home-theater system, in your kitchen, bathroom, or bedroom, etc. With the multipoint technology, Bluetooth car kit can connect 2 Bluetooth devices at the same time for enjoying your music while won't miss any calls. Premium-quality sound.33ft connection range low signal delay. Make your Car AUX audio sytem and Home Theater av HiFi surrounding system become bluetooth compatible. Enjoy music freely,get rid of the tangle cables. Our service team are always online for you (7/24)!